Charles River, shell: 100% polyurethane, backing: 100% polyester, body lining: 100% polyester, sleeve lining: 100% nylon. Green:Bright green women's raincoat with 1/4-length zipper and hood. Adjustable velcro cuffs, front pocket and zippered front pocket. Features pink, green, white, and dark blue plaid patterned interior. Ivy 'B' embroidered in brown with white outline above 'BROWN' embroidered in brown on left chest. Blue: Periwinkle blue reflective women's raincoat with dark grey stripe across back, full-length zipper and drawstring hood. Adjustable velcro cuffs, two zippered front pockets. Crest in white, cardinal, and black above 'BROWN' embroidered in black lettering on left chest. Features grey mesh interior. 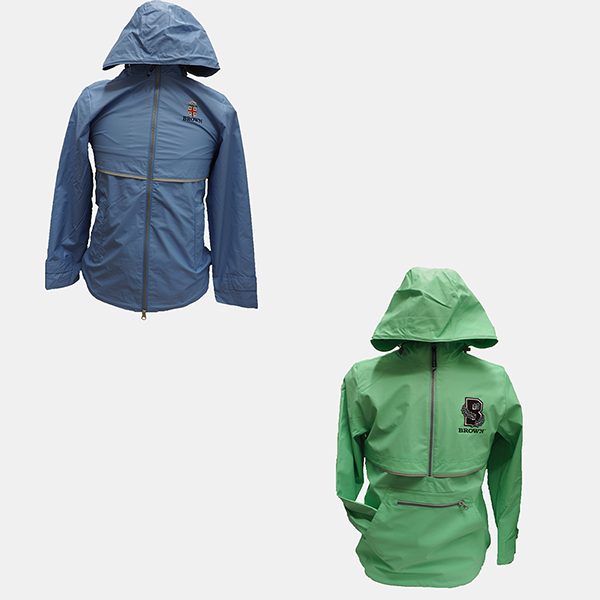 Please select option for Charles River Women's Raincoat - $69.99.